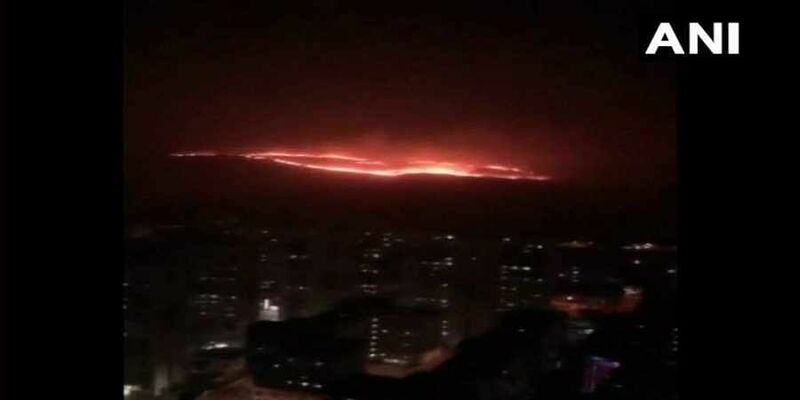 MUMBAI: Mumbai's lungs came under threat on Monday after a forest fire broke out on the boundary of the Sanjay Gandhi National Park (SGNP) in the western suburb of Goregaon. The fire is believed to have broken out in the evening. The fire services department was alerted around 6.30pm. While three fire engines were immediately sent to douse the fire, the trucks had problems reaching the source of the fire. Eventually, the fire call was upgraded to level two and then to level three. In all, ten fire engines, seven jumbo tankers and three quick response vehicles were pressed into action by around 9.30pm to fight the fire. Naturalist Shardul Bajikar, who works closely with SGNP officials in the area for conservation of green spaces, some birds and animals could be trapped in the fire. Fire officials on the ground could be spotted using branches to douse the fire. After the fire started spreading to the other side, nearby police stations were put on alert to evacuate trapped locals and livestock, if any. some development plan might be on the papers of TRANSPARENT CM & TRANSPARENT GOVT.